IT’S BEEN a long time since I’ve read a children’s publication. I’ve never reviewed one before, so I didn’t know what to expect. Therefore, Peter, Paula and the Pelican was a first for me. 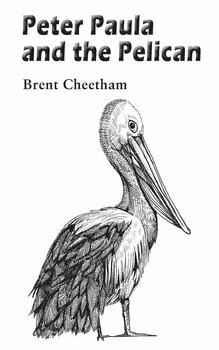 If that wasn’t enough, the author is an old mucker of mine, Brent Cheetham! Published towards the middle of 2016, Peter, Paula and the Pelican is the first of several booklets he has written. The others include The Rake’s Regression (Nov 2016), Ecstatic Essays (Apr 2017), andCuffley Capers (Aug 2017). ‘a romp of a story, combining humour, pathos and nonsense for the edification of the young and the not so young adults who are still young at heart. The author confirms that he has not yet had a visit from the men in white coats. The author is aged 60, lives in the village of Cuffley, Hertfordshire, and still is partial to the odd peanut butter sandwich although he says he prefers a nice strong cup of English breakfast tea over a glass of ginger beer’. Peter, Paula and the Pelican is set in England in 1925 and tells the tale of brother and sister Peter and Paula Brown who live in a cottage in the village of Sleepy Hollow. Like many children they are getting under their mother’s feet so she sends them out to play. Making their way to the local woods they come across hole in the bottom of a hedge which in turn leads to a large oak door. Peter, who is the oldest, is all for opening the door. Paula, on the other hand, worries in case there are ‘monsters, lions or dragons’ on the other side. However, Peter notes that the last dragon was “killed years ago by somebody called St. George.” (I thought that this was a nice way of weaving a little heritage and tradition into the book). Disaster strikes when the door slams behind them as they become stuck in this ‘strange land’ that boasts two suns in the sky. However, this is relatively normal compared to the adventure that follows and the characters they meet! So who or what is ‘the Brent’? In the best traditions of any children’s publication he is some form of ogre. He ‘is a great big ugly giant, with moles on his face, who goes to the big city every now and again and demands peanut butter sandwiches and often knocks off chimney pots from the roof of the city houses’. The Pelican has offered to take them to the ‘big house’ and so the adventure begins. As mentioned earlier they meet some very weird and wonderful characters. They include talking chickens who are knitting square egg cosies for the square eggs that they lay. There’s also atractor-driving talking monkey, ‘silly sheep’ who have a problem as they never tell lies, a talking tablecloth, peanut butter mines (for some reason Back to Front Land seems to thrive on peanut butter) and a sign that points in two opposite directions – but to the same location! I laughed at the method of transport that was taken to see the Prime Minister and King Lupin in the ‘big city,’ for Peter and Paula sat on Brian’s back whilst the Pelican perched on his head. This must have been a sight for sore eyes. Needless to say, Brian the nonsense horse talked absolute nonsense during the journey. At last they reach their destination and manage to sort out ‘the Brent’ problem. I don’t want to go into any detail how they did this – I don’t know if I’m over-thinking this part of the booklet, but I think much of what’s wrong with modern Britain can be explained here. Read it for yourself and see if you come to the same conclusion. The only thing I will say is that Paula is the hero of the hour. I hope I’m not spoiling things by saying that the children make it home ok. However, they do get some help from the Pelican, ‘the Brent’ and a bi-plane made of wood and canvas! I must admit I really enjoyed Peter, Paula and the Pelican. I chuckled to myself as some of what was said (especially by Mrs. Brown) brought back memories from my own childhood, which admittedly wasn’t exactly yesterday. Typical English eccentricity flows through it – Peanut Butter sandwiches and Ginger Beer feature heavily – and I wondered how Brent (the author as opposed to the ogre!) managed to dream up these characters. Indeed, where did he get his inspiration from? It’s also Politically Incorrect in parts and the gender stereotypes would give the Orwellian ’thought police’ many a sleepless night. The only downside were a few spelling and grammatical errors, which the author has acknowledged. Hopefully, they’ll be sorted out in any reprint. However, they don’t really spoil this booklet at all and I’d happily recommend it to anyone who reads to their children. Enter your email address to subscribe to Counter Culture and receive notifications of new posts by email. Sign me up to Counter Culture!